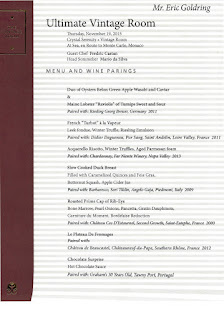 In this fourth installment discussing my cruise on the Crystal Serenity last month I wanted to focus on the special events Crystal had which truly impressed me and give good reason for those who truly love food and wine to "move up" from a premium cruise line or consider "moving over" from a luxury line. During this cruise we were truly fortunate to have Kevin Zraly, the James Beard Lifetime Achievement Award recipient, wine director of Windows on the World, and author and teacher of the Windows on the World Wine Course onboard for some special "enrichment" as part of Crystal Food & Wine Cruise. Kevin held two very entertaining, high energy and informative wine tastings and, for 14 of us willing to pay, selected the wines for a truly spectacular Vintage Room dining experience. Unlike the "shtick" that Celebrity Cruises calls a wine tasting (that is really more of a sales pitch to purchase wine glasses while sucking down bad wine...and I really like Celebrity Cruises) or Oceania Cruises significantly extra cost wine tastings, Crystal Cruises provided truly high quality wines with a true master (not a ship sommelier) each lasting about an hour. This was Kevin's first return to the sea since the fall of the World Trade Towers and while it was a bit emotional for him, he was "on" and made the wine tasting about what it should be: Fun! So even if you really didn't care much about the tastings, you had fun! Complimenting the wine events were culinary events by Chef Fredric Castan, who worked his way through a number of two and three star Michelin restaurants, as well as executive chef positions with Ritz Carlton, Sofitel and St. Regis while also appearing on the television shows Hell's Kitchen and At the Chef's Table. In addition to the expected cooking demonstration, where he was quite personable and charming, he oversaw a special menu one evening in the Main Restaurant. However, his real impact was his personally preparing the seven course Vintage Room dining experience I was able to enjoy. Crystal Cruises' Vintage Room is a rarefied event where only 14 guests are served a specially pared dinner in, of course, The Vintage Room. Fortunately for me, with Kevin Zraly and Chef Fredric Castan onboard, this was not the "Classic" Vintage Room, but the "Ultimate Vintage Room". Now, this experience comes with a hefty price: $350 per person ($250 for the Classic). 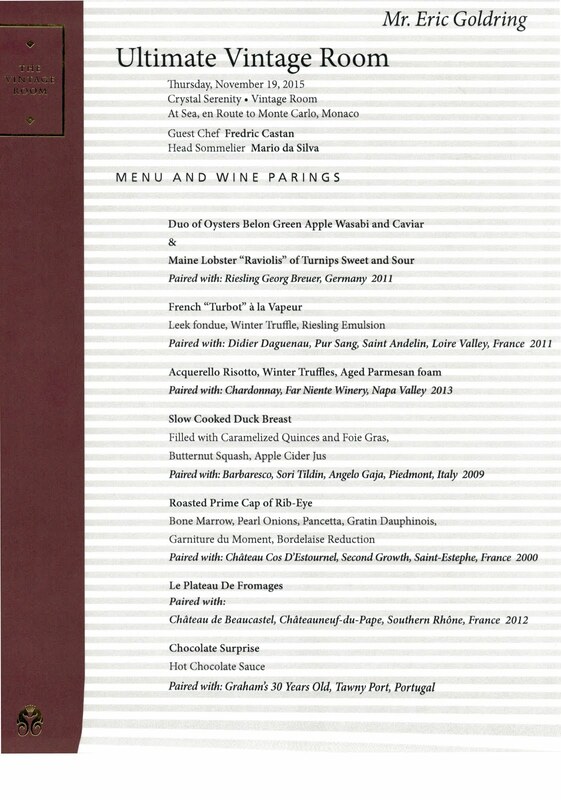 Before I explain the menu and wines, I received a study from Michelin earlier this week about what people are willing to pay for an "unsurpassed" meal. It varies by age group and location, but for Americans this is right on par with what a male from California would pay, but about triple what a 65+ year old woman from the Northeast would be willing to pay. In other words, you really have to want to do this for the experience...and I was looking forward to it for months. The first wine (after our Billecart-Salmon Rose Champagne) was a Georg Breuer Reisling; and during my 2015 Goldring Travel Culinary & Cultural (Food & Wine) Cruise I had a private wine tasting at Georg Breuer with seven different wines...including the Nonnenberg Rheingau Reisling chosen for this dinner. Of course there was, as you can read above, other truly exceptional wines...and delicious to the eyes and mouth culinary treats. Along with the menu comes an excellent written description of the wines and the vineyards, but trust me, after this meal reading is the last thing you are going to do! Having sailed on all of the major luxury cruise lines and quite a few of the premium ones, I am confident in saying that other than private events, such as a Goldring Travel Culinary & Cultural Cruise (noting our August 2016 event is almost sold out), Crystal Cruises offers the highest levels of such experiences. For those looking to "move up": Remember, these wine tastings are included in your fare and is a significant step up not only for the wines, but the sommelier presenting them. For those considering a "move over", the Vintage Room experience is unparalleled. But, alas, with all the superlatives and fine dining, there is one test that undertake on every cruise: The Hamburger and Hot Dog Test. For me, it is about the little things and, to be sure, with all sorts of exotic and rich foods engaging your palate on a cruise, sometimes you need the basics...and those basics give telltale signs as to the "regular" food onboard...and again it proved to be true. 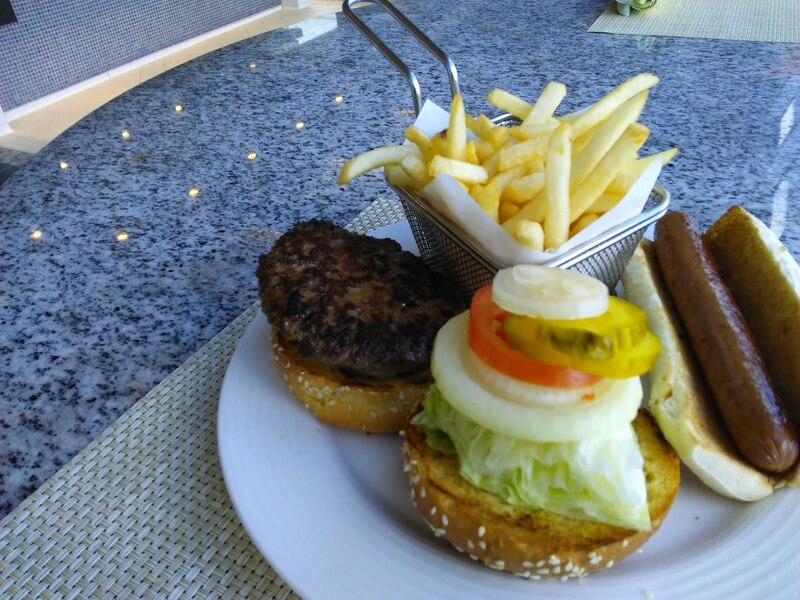 As you can see the presentation was pretty darn nice with the buns properly toasted, the hamburger and hot dog both properly cooked, all the appropriate garnishes and the French Fries creatively presented. But, unfortunately, both the hamburger and hot dog (which was really a miniature hot dog) just didn't have much flavor. Ouch. Unfortunately, I did find the same sort of issue with flavorlessness in suprising ways, such as a truly delicious spicy Thai soup with chicken in the Lido. The problem was that the chicken was clearly cooked elsewhere without any spices and was added at the last minute to the soup. Nitpicky? Yes, I admit it! But with so many culinary hits (Nobu's Silk Road, Vintage Room and even the Main Dining Room) it was surprising. Suffice it to say, that Crystal Cruises really does rate as "Foodie Worthy" with a consistency that, in the luxury cruise market, is only topped by Seabourn. So if you are looking to "move up" you will be extremely impressed and if you are looking to "move over" from any luxury line you will be more than satisfied! Personally, I can't wait to get back onboard for another Vintage Room Experience...and maybe even a wine tasting or two!